Off-grid street and area lighting applications require batteries that can withstand the daily deep battery cycling inherent in solar applications. Many highway, traffic, parking, neighborhood and security lighting projects depend on Trojan’s deep-cycle AGM battery technology for long battery life and consistent performance day in and day out. Reliable wireless communication is something demanded from all service providers. With most telecom equipment located in remote areas with no access to the grid, telecom companies are presented with the challenge on how to effectively supply electricity to these locations. Solar, wind and hybrid systems with battery backup for energy storage using Trojan’s deep-cycle batteries have proven to be the most cost-effective and reliable solution to power these remote communication devices. Security systems in remote locations must have a consistent power source in order to provide effective coverage. When access to grid power is not available, a battery-based solar energy solution is a low maintenance and cost-effective way for remote security systems to operate without interruption. Trojan’s deep-cycle batteries deliver reliable power for these applications operating in the most remote, rugged or harsh conditions. Remote oil and natural gas production sites are quickly adopting renewable energy systems with battery backup storage to provide consistent, reliable power for equipment. Trojan’s deep-cycle batteries deliver electricity to these isolated well sites to operate automation, monitoring, control, alarming and point-to-point radio communication applications. Small-load telemetry applications frequently require the repositioning of a radio transmitter/receiver in remote, sometimes rugged locations. To enhance response times for critical repositioning activities, stand-alone battery-based solar power systems are implemented to provide a reliable energy storage solution to power this equipment. 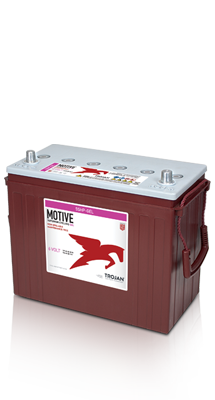 Trojan’s deep-cycle batteries are designed for peak performance in these types of applications.